This exceedingly rare first edition, published in 1834, is a large, oblong folio bound in nineteenth-century German black half-morocco. 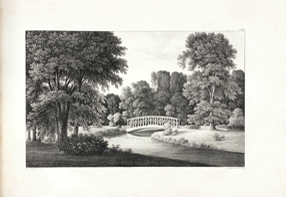 Sumptuous in format and contents, its forty-four lithographic garden views, with overlay flaps in the style of Humphry Repton, depict Park Muskau, Pückler’s 3300-acre princely estate. The property, which survives as a park to this day, straddles the River Neisse, now the border between Poland and Germany.